Nerima Art Museum presents a Living National Treasure’s sublime works of Japanese metalsmithing through February 11. Admission discounts are available for TAB app and MuPon subscribers. Thomas Doyle explores familial and social fault lines in haunting dioramas at Diesel Art Gallery until February 13. In time for the early-February Setsubun festivities, when good luck is summoned and the bad is cast out, centuries-old picture scrolls at the Nezu Museum tell the tale of Kyoto aristocrats who banded together to rid their lives of a mountain-dwelling demon. Ends February 17. Follow mysterious white rabbits through the history of the Ueno neighborhood in a multi-media exhibit and event series centered on what was once a train station for the zoo. Until February 24. 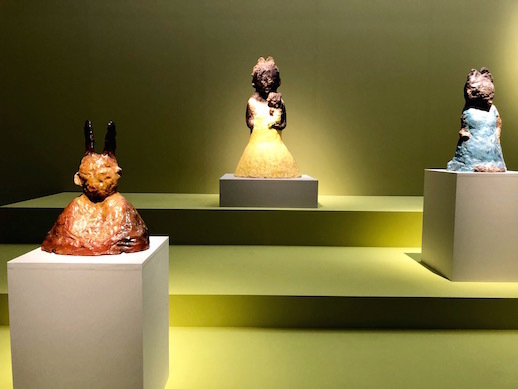 For more than two decades, the Domani exhibit has featured the work of promising young artists sent overseas to broaden their horizons and hone their skills. This year’s show includes sculptural installations from the United States by social art organizer Tsubasa Kato, paintings from London by Yoi Kawakubo, and video projects from Paris by Nobuhiro Shimura. At The National Art Center, Tokyo until March 3. Through educational toys, picture books, photographs, and models, Architectural and Spatial Works Designed for Children spotlights the evolution of Japanese spaces geared specifically toward youngsters’ play and learning. At the Shiodome Museum through March 24. (Discounts available).